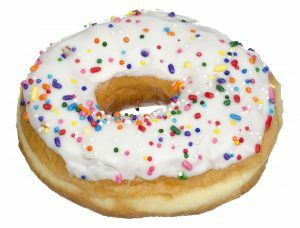 The History of Sprinkles | Shipley Do-Nuts - Order Donuts Online Now! Sprinkles are pretty much everyone’s favorite donut topping! But have you ever wondered where they came from, who invented them, and what got them so popular? Well, wonder no more – we’re here to tell you all about the history of sprinkles. Order Donuts with Sprinkles Online Now! “Jimmies” seems to be quite a popular term for sprinkles, and chocolate ones specifically. 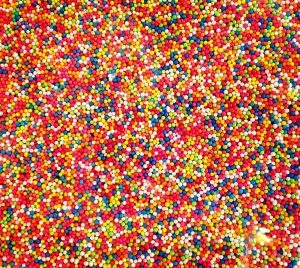 The term’s history is a bit tough to uncover, but Just Born, a candy-making company founded in 1923 in Brooklyn, claims that they coined the term “jimmies” AND invented sprinkles themselves. Yes, jimmies were invented at Just Born and we have in our archives some of the advertisements from that time period and containers with the word “jimmies” and the Just Born logo on them. Although there is nothing in writing to confirm it, it is commonly known here that the chocolate sprinkles were named after the Just Born employee who made them. However, sprinkles were already popular in the 1920s according to newspaper archives. In fact, a New Hampshire newspaper advertised a treat with chocolate sprinkles on it in 1921, before Just Born was established. Others say that Just Born used the word “jimmies” as a way to brand their sprinkles. In the end, there seems to be no clear answer on where the word came from. It’s just one of those mysteries historians may never solve! The first recorded usage of sprinkles was in the 18th century, but were probably used before then to decorate pièces montées and desserts. Sprinkles can also be traced back to 1936, when Gerard de Vries invented Dutch hagelslag (sprinkles) for Venz, a Dutch company. The word “hagelslag” comes from a Dutch word meaning “hail,” a common weather event there. “Hagelslag” is used on top of bread slices. As with most sprinkled treats, they require something sticky to adhere to so they don’t fall off. The Dutch typically covered their bread with a layer of butter in order to make their hagelslag stick. The first “sprinkles machine” was actually created by de Vries and Venz. Fun Fact: Only hagelslag with a cacao percentage of over 32% is truly chocoladehagelslag (chocolate sprinkles). If the percentage is below 32%, it has to be called cacaofantasie or cacaofantasie hagelslag (cacao fantasy sprinkles). Get Tons of Sprinkles on Your Donuts When You Order Online! Shipley Do-Nuts is proud to offer nonpareils, sprinkles, jimmies, or whatever you call them as a topping on our delicious, freshly-made donuts. Simply click the button below to start your online order and satisfy that sweet tooth!